the sounds of the surf and colorful sunsets over the Gulf. Residents of Casey Key enjoy secluded privacy within easy reach of every mainland convenience. This unparalleled island lifestyle is one of the main reasons why those who could live anywhere in the world often choose Casey Key. mangroves, thesurf exclusive amenities promise to fill the soundswhile of the and Sanderling colorful sunsets over the Gulf. each day with beach-combing, socialprivacy events and boating. Residents of Casey Key enjoytennis, secluded within easy The Members of Sanderling appreciate the Clubâ&#x20AC;&#x2122;s rich Sarasota reach of every mainland convenience. This unparalleled island history and magical charm, as well as its lush, natural landscape lifestyle 4672 is one of the HARRIER main reasons why those who could live DRIVE | SARASOTA and understated,PINE yet architecturally diverse, homes with uncommon anywhere in the world often Casey privacy. To 3 complete lifestyle, the club is within easySF reach of Bed / 2theFull & choose 1 Half Bath | Key. 2,558 the enchanting arts andAvailable culture of at downtown $789,999Sarasota. Dania Perry – The #1 CENTURY 21 Realtor in the World - for the 6th Time! The Thorn Collection | 877-MT-SELLS (877-687-3557) | www.TheThornCollection.com ÂŠ 2018 Coldwell Banker Real Estate LLC. All Rights Reserved. Coldwell Banker Real Estate LLC fully supports the principles of the Fair Housing Act and the Equal Opportunity Act. Each Office is Independently Owned and Operated. The Thorn Collection | 877-MT-SELLS (877-687-3557) | www.TheThornCollection.com © 2017 Coldwell Banker Real Estate LLC. All Rights Reserved. Coldwell Banker Real Estate LLC fully supports the principles of the Fair Housing Act and the Equal Opportunity Act. Each Office is Independently Owned and Operated. Coldwell Banker, the Coldwell Banker Logo, Coldwell Banker Global Luxury and the Coldwell Banker Global Luxury logo are service marks registered or pending registration owned by Coldwell Banker Real Estate LLC. R E P R E S E N TAT I O N MAKES ALL THE Sotheby’s International Realty® and the Sotheby’s International Realty logo are registered service marks used with permission. Each office is independently owned and operated. Equal Housing Opportunity. Price Reduction Best Value on the beaches! PO BOX 993. Ellenton, FL 34222 813.964.5625 SUNSHINE PUBLICATIONS, INC. 1020 Suncast Lane, El Dorado Hills, CA 95762 916.458.6010 | info@luxuryhomemagazine.com LuxuryHomeMagazine.com Chief Executive Officer Brad Taylor brad@lhmmediagroup.com Chief Financial Officer Cathy Taylor cathy@lhmmediagroup.com Publishing Opportunities publishing@lhmmediagroup.com Visit Our Blog: LuxuryHomeMagazine.com/blog Published six times per year – ©2019 Sunshine Publications, Inc. 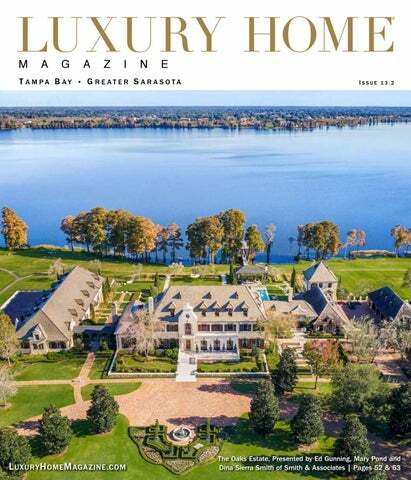 Luxury Home Magazine®, Luxury Living and Lifestyle™ and LuxuryHomeMagazine.com are protected trademarks of Sunshine Publications, Inc. and LHM Media Group. 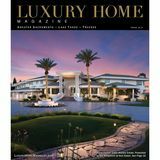 Publisher is an authorized independent distributor and licensee for a market specific area of Luxury Home Magazine®, Luxury Living and Lifestyle™ and LuxuryHomeMagazine.com. Publisher is licensed through Sunshine Publications, Inc. and LHM Media Group. Sunshine Publications, Inc. and LHM Media Group are not responsible for the contents of the magazine or the acts or omissions of the publisher or its representatives and makes no representations or guarantees. Reproduction in whole or in part (including materials, photos and formats) in any form without written permission from Sunshine Publications, Inc. and LHM Media Group is prohibited. All submissions become the property of Sunshine Publications, Inc. and LHM Media Group and may be used in any print, digital, social and online media. All rights reserved. The information contained in Luxury Home Magazine® is deemed reliable, but not guaranteed. Contact each individual agent to verify information, which is subject to change. Contemporary Coastal Estate! 3 Bed/3 Bath, 3,446 sq ft, Gulf Facing, Pool, Multiple Upgrades, Home Warranty. Beautiful Gulf Facing Home! 5 Bed/4 Bath, 3,716 sq ft, Balcony, Pool, Fireplace, Dock, Oversized Yard. his is a once-in-a-lifetime opportunity to own one of the most magnificent trophy properties in the U.S. This waterfront estate with adjacent lot totals nearly 160 acres on the water and is the perfect island retreat to get away from it all. A gated entry and tree lined driveway will lead you to The Victory Mansion showcasing classic and modern design with coveted wide-open views of Tampa Bay. Enjoy direct Gulf access with unobstructed sunset views. Craftsmanship is unparalleled with intricate custom designed ceilings including hand applied gold leaf, marble floors with inlay, world class custom chandeliers, solid wood cabinetry, Onyx master bathroom, custom designed trey ceilings with lighting, dual fireplace, movie theater and covered outdoor terrace. The enviable outdoor space is highlighted by a gorgeous infinity pool area with spa, basketball court, tennis court, additional separate garage & storage, inside gym with pool bath, covered grill area, boat dock with lift, block BAYHAVEN DRIVE construction, hurricane rated 8022 windows & doors, private Views of the Gulf!of beach area, and a rooftop deckOpen with Water unobstructed views 4 Bed/3 Bath, 3,232 sq ft, Updated, Pool, downtown Tampa and St Petersburg. Lanai, Private Dock, Lift, Top Schools! Bayou Club Estates 4 Bed/5 Bath, 5,650 sq ft, Golf Course Views, Salt Water Pool, Must See Call Today! Beautiful Coastal Updated Home! 4 Bed/3 Bath, 2,832 sq ft, Bayway Isles, Pool, Upgrades, New Kitchen & Flooring. Florida’s Living at its Finest! International3 Presidents Elitesq ft, Waterfront, Pool, Bed/3 Bath, 3,446 Multiple Balconies, Deep Deeded Slip, Golf. HIGHLANDS OF INNISBROOK | Custom built in with 4 bedrooms plus study, 3 baths, family room with fireplace plus media room…voted “design perfect”! Beautiful mill work, crown moldings, coffered & boxed ceilings, huge chef inspired kitchen, master bedroom, retreat. Poolside kitchen, brick paver lanai, salt water system on pool and spa. Magnificent & loaded with custom appointments. World class amenities in this gated and secured community. BAYOU CLUB | Overlooking serene golf course with gorgeous pool and spill over spa plus fountains for the true Florida oasis. Totally renovated and impeccable, this home is 3,966 sq.ft. of beauty with 6 bedrooms., 4.5 baths and stunning “chef inspired” kitchen. Beautifully landscaped grounds located on a quiet cul-de-sac. Easy commute to Tampa and all the Gulf beaches. GRAND CYPRESS | Flowing with lavish appointments and upgrades, this 4 bedrooms plus study, 3 baths, 3 car garage has it all! Located in gated “Grand Cypress” lakefront community with private boat ramp and dock to Lake Tarpon! Chef inspired kitchen with chocolate stained wood cabinetry and center. island. Great Room design with separate formal dining room, extensive distressed wide plank hardwood, covered lanai with brick pavers to open pool! Serene views of “Lake Tarpon”, preserve and the “eagle’s nest”! PRISTINE MANASOTA KEY GULF FRONT 6060 MANASOTA KEY ROAD, ENGLEWOOD 5 BED/5 BATH/9,489 SF | ELEVATOR, HURRICANE SHUTTERS Located within an Old Florida Hammock of Century Old Oaks and Lush Tropical Flora awaits this Supremely Constructed Beachfront Estate. This notable residence spans over 1.10 acres of Pristine Manasota Key Gulf Front offering privacy, quiet beaches and stunning Florida Sunsets. Outdoor living revolves around the multi-level lanais and the heated gulf side pool/spa. speed!) and the Gulf in 15. My Clients are my Priority. nder Construction Two (2) Luxury Contemporary Waterfront Townhomes. Stunning views of the Intracoastal from your patio and living areas, exquisite finishes, private driveway, and a 2 car garage. Gives the feel of a home with the maintenance free lifestyle of a condo-the best of both worlds. @ 3,100 to 4,200 sq. ft.
Waterview. 4 bedrooms 3.5 baths. of natural light, and a view throughout the rear of the home to the pool area. The walk-in wine cellar. living area and family room to the tropically landscaped and very private pool area. to lanai and pool. 5 bedrooms, 3.5 baths and 2 car garage. and beautiful chandelier and your eyes are immediately brought through the formal 6 bedrooms 4.5 baths. This waterfront retreat is privately gated and nestled amid lush tropical landscape. Amenities include an elevator, theater room, ample grounds with pool, dock and great water views. An architectural jewel with stunning finishes throughout! A floating staircase, stunning library bridge, travertine wall and suspended wood-slat ceiling are among the striking features. Sunset Park Isles | 2415 South Dundee Street Carrollwood Village | 13031 Whisper Sound Dr.
Madison Homes new Davis Islands A stunning pool home with timeless finishes Welcome to the new waterfront pool home, Expansive panoramic views of Carrollwood waterfront will reveal the newest in luxury offering a 1st floor office, guest suite, formal custom designed by Taralon Homes with Golf and Country Club can be yours at this design in a Modern Farmhouse style. expected completion in June 2019. dining, wine room and outdoor kitchen. newly renovated modern masterpiece. This one-of-a-kind property offers luxury from top to bottom with attention to detail throughout. Enjoy open bay views and Florida sunsets. Newly completed by Madison Homes this stunning Beach Park waterfront pool home features tranquil deep-water views and direct bay access. Situated on a large, private lot this pool home offers an open kitchen overlooking a bright family room, plus den and fenced backyard with great outdoor kitchen. This light and bright home offers an This 2017 built Sunset Park pool home is excellent floor plan and is ideally located on impressive on every level from the fresh new a generous 118x106 homesite. landscape design to the tastefully enhanced upgrades throughout the interior. The #1 Sales Team in Tampa Independently Owned and Operated. Coldwell Banker, the Coldwell Banker Logo, Coldwell Banker Global Luxury and the Coldwell Banker Global Luxury logo are service marks registered or pending registration owned by Coldwell Banker Real Estate LLC. Enjoy amazing panoramic views of both the Gulf of Mexico and the Intracoastal waterways from every room in this 12th floor condo in the Residences at Sandpearl, an exquisite upscale Gulf front gated community located directly on the sugar white sandy Clearwater Beach. Executive style waterfront living! This breathtaking open waterview suits every aspect of the upscale living you want. There is room for the yacht and the recreational sports at this 6424 square foot home with a 3 car garage, 5 bedrooms, 7 bathrooms, media room, office, formal living and so much more. The exterior rear terrace is perfect for morning coffee watching the dolphins play or a beautiful dinner with friends at sunset! Beach front Living with no maintenance in the 18th floor beach front condo! 3 bedrooms, 3 baths large living room — a waterview from every room. Entertaining has never been easier than it is here. This is what executive living on the beach should be. Only a handful of units have this outstanding, direct beach front view — unobstructed! You can see South all the way down the beach and North goes on for miles! The best part is the magical sunset views you experience as you are winding down the day…this unit is how you get away from it all. 813.727.8622 | eddiewright@kw.com eddiesellsflorida.kwrealty.com YO U R TA M PA F L O R I D A R E A LT O R , S E R V I C I N G A L L S U R R O U N D I N G C O U N T I E S ! Sunrise to sunset the views from this waterfront home are unforgettable, feeling like open bay. A spacious lot is an understatement at 92.5 x 115. Current owners have kept the home immaculate. 9 ft. ceilings heights are trimmed with beautiful molding throughout. A screened lanai extends your living space year round for relaxing days by the pool or evening of entertaining. With deep waters, jump on the boat from your private dock. Located on Bay Way, a circular street that lives like a private neighborhood. Do not miss the opportunity! If you desire timeless elegance, modern conveniences, the best school district and on a park-like street, look no further. This classic, historical 1922 Colonial home is in the highly sought after Parkland Estates just a short walk to great restaurants and Bayshore Blvd. The home boasts endless windows for natural light, original hardwood floors throughout, high ceilings, crown molding, and two gas fireplaces, plus a detached 1/1 guest house. Don’t miss out on this meticulously maintained updated home. There is no substitute for Mary Lou’s 30 years of market knowledge & experience! CUSTOM-BUILT LAKEFRONT estate home on beautiful ski-lake, Platt Lake. Lovingly built & cared for by original owner. Notable features include a grand entrance of stunning wood curved staircase and soaring 20+ foot ceilings, home office, & a 250+ bottle climate controlled wine cellar. A full screened balcony overlooks the glorious outdoor space featuring huge swimming pool/spa AND panoramic lake views. PRIVATE RETREAT with many custom details one would expect in true LUXURY home. Includes a media/bonus room, office, POOL/ SPA & Magnificent OUTDOOR living spaces. CANAL FRONT ranch home exudes pride in ownership. Beautiful & practical updates throughout, including a fabulous backyard & NEW dock/lift! CHECK US OUT ON SOCIAL MEDIA – FOR ADDITIONAL LISTINGS & OPEN HOUSE INFO! 1110 Pinellas Bayway #113, Tierra Verde, FL 33715 | (727) 865-1000 | www.SunsetPointeFL.com | Equity Consultants, Inc Oral representations cannot be relied upon as correctly stating representations of the developer. For correct representations, reference should be made to this brochure and to the documents required by florida statutes section 7185033 to be furnished by the developer to a buyer or lessee. This does not equal housing constitute an offer to sell where prohibited by law. Developer is a licensed Florida real estate broker. Ganton • Available at – $698,000 Waterfront Opportunities from Sarasota Bay to Anna Marie Island. From The Concession to the Coastline… Call us for your luxury custom home consultation today. 4 Bed | 3 Bath | 2,822 SF | 2 Car Garage | $950,000 This Victorian style masterpiece was built in 1991. The open floor plan and large backyard are perfect for entertaining friends and family. The home boasts a beautiful new kitchen and family room combination as well as offering both a formal living and dining room. This home has newly renovated bathrooms, a new roof and a brand new garage. 2 Bed | 2 Bath | 1,354 SF | 2 Parking Spaces | $665,000 This home has a substantial balcony that overlooks spectacular city and water views! The beautiful kitchen has Quartz countertops, large cabinets, Bosch SS appliances, including a gas range, a GE wine cooler, drawer microwave, and range vent. The trendy hardwood flooring allows for open, clean lines in the entire living area making for a spacious flow throughout the condo. 16726 Valseca de Avila | $2,349,000 EXQUISITE 2 STORY ESTATE in Avila, Tampa Bay’s Premier Gated Country Club Community. This luxury home, full of exceptional details, is situated on a beautiful large corner lot with lush gardens. The double glass door entry leads to an impressive two-story foyer, opening to the formal living room & dining rooms. SPECTACULAR CUSTOM BUILT home located in Avila, Tampa Bay’s premier gated country club community. Offering 5 bedrooms and 5 full baths. On a quiet preserve lot, on a cul-de-sac, this bright open floor plan is perfect for family gatherings and entertainment around the sparkling pool and lanai. SPECTACULAR TRADITIONAL HOME situated in premier Gated Country Club Community. This spacious home offers approx. 7,000 SF of living space, and features 6 bedrooms, 5 full and 2 half baths, formal office, studio/playroom, loft, leisure and breakfast room. 16305 Millan de Avila | $2,350,000 IMPRESSIVE TWO-STORY TRADITIONAL brick, privately situated at the end of a cul-de-sac, surrounded by conservation and a peaceful pond. This luxurious executive estate offers a two story entry having a sweeping staircase, breathtaking chandelier, 5 en-suite bedrooms, 6 and 1/2 baths, and gourmet kitchen. STUNNING SINGLE STORY, Mediterranean Arthur Rutenberg custom “Capri” home. Situated on a private conservation home site, in Comunidad de Avila. Eye-catching architectural design and details inside. Four bedrooms, three full, 2 half baths, office and bonus room. CHARMING 2-STORY TOWN-HOME nestled in Avila’s Garden Villa enclave, surrounded by lush landscaping and canopy oaks. This home offers 2,940 SF, 3 bedrooms, 2 & 1/2 baths, huge great room having a large stone, wood-burning fireplace, separate formal dining room, and well designed kitchen. Nestled along the shores of Lake Thonotosassas is a private, gated residential reserve where quiet beauty meets vast rolling hills. Stonelake Ranch, a multi-acre homesite community, offers serene luxury living, including two island bird sanctuaries. A new breed of medicine. T E N N I S! workshop). Bonus room with wet bar & balcony. Grand dining room. Island kitchen with Viking gas cooktop, double ovens, two dishwashers and SubZero refrigerator. Beautiful office. Reclaimed water irrigation. Large pool and spillover spa with stone deck. ustom contemporary home on Davis Islands. Quality craftsmanship & design created by Joe Rokop. The Scandinavian design-characterized by simplicity & functionality is highlighted throughout the home. Splendid clean lines & neutral colors throughout. Windows galore to enjoy the natural sun light in each room! Observe the open concept & large glass panel floor to ceiling windows as you enter the home. DuChateau oak engerineered flooring throughout the home. Rustic steel-designed oak & steel stairway from the garage & to second level. Gourmet kitchen is complete w/custom 42” cabinetry, Dupont London Sky quartz countertops & waterfall, Thermador appliances, double ovens, wine refrigerator & Thermador induction 36” cooktop. A delight to entertain outside on the 17 X 17 covered lanai & elevated saltwater pool built by Riveria. Master suite w/floor to ceiling glass panel windows & tray ceiling. Walk-in custom organized closet w/ access from bedroom & bath. Master bath has a spa feel; marble flooring, back-splash & vanity w/dual sinks, glass walk-in shower and Victoria & Albert soaking tub. Two guest en-suites on the second floor w/bathrooms having marble flooring, vanities, one tub/shower & the other glass shower. Conveniently located to Downtown Tampa and all it has to offer!! MODEL PERFECT NEW HOME! West Bay Homes Granada II model in Lakeshore Ranch. No corners cut in upgrades or design. The over 4800 sq ft 5 beds/5 baths, w/office & oversized bonus loft. Kitchen complete w/white wood cabinets, granite counter tops, stainless steel appliances, gas cook top, wall mounted stainless hood, tile back splash & breakfast bar w/pendant lighting. our sanctuary awaits... In 2015 the home was completely rebuilt and updated! The paved circular drive drops you off at the glass etched front entry doors. As you make your way through the foyer with soaring 20-foot ceilings, you will immediately notice the high quality workmanship! The home has all new high-impact doors, windows, and skylights. A private office and half bath is to the right, along with double entry pocket doors to the formal living & dining room. The living area is complete with custom Plantation shutters, crown molding, wood flooring, and 8â&#x20AC;? baseboards. Delight in the expansive kitchen & family room right off the voluminous covered screened lanai and pool area. The custom kitchen features wood cabinets, granite counter-tops, and best-of-the-best appliances, including a Wolfe gas cook-top with remote control exhaust fan, Wolfe convection oven & microwave, Subzero extra-large side by side refrigerator/freezer, ASKO dishwasher, ice maker & water filtration system. Entertain at the expansive island with granite counter top and custom cabinets below. Escape in the oversized master retreat with direct access to the pool area. The master bathroom has marble throughout and a massive walk-in custom closet. This home has a colossal 4 car garage with epoxy flooring. Complete with an amazing Generac whole house generator! This home is definitely a must see in the gated community of Avila. EXPERIENCE MAGNIFICENT SUNSETS over Lake Strawberry! Enjoy all the advantages of lake front living in the gated community of Crystal Lake Manors. Private dock w/built-in seating to relax in the sun. Total of 100 ft of lake frontage w/boat ramp on ski size lake. The completely updated Florida style home has high ceilings, skylights, plenty of upgrades & split floor plan w/4 beds & 3 baths. 4113 CAUSEWAY VISTA DRIVE | THE RESERVE OF OLD TAMPA BAY 4 Bed | 3/1 Bath | 4,058 SF | $1,625,000 Are you looking for a respite from the hustle and bustle of City life while remaining conveniently connected to all that Tampa Bay has to offer? Welcome to The Reserve of Old Tampa Bay, a privately-gated enclave of 31 executive homes overlooking Old Tampa Bay. Loads of custom details throughout this magnificent home too numerous to mention here. What are you waiting for...? Come live the life you deserve and have always dreamed of. Beautiful Residences on Harbour Island 1036 ROYAL PASS ROAD HARBOUR ISLAND 4 Bed | 3/1 Bath | 3,200 SF | $975,000 A wonderful courtyard style home awaits you in this beautiful offering located on prestigious Harbour Island, a private 24-hour gated community island oasis in the Heart of the City. Exceptional corner location overlooks a beautiful parklike area with pond and fountain and is solidly constructed with concrete block 1st and 2nd floors and a unique rooftop terrace capturing panoramic views of the City skyline, Channelside, and Port Tampa Bay, where cruise ships sweep in and out of Port. Helping both buyers & sellers throughout Tampa Bay, with special expertise in Luxury Homes. Sunset Park Isles | 5128 W Longfellow Avenue 4/4.5 | 5657SF | $5,500,000 This one-of-a-kind pool home offers magnificent views of Tampa Bay. Enjoy the allure of volume ceilings, natural light and stunning views at every turn, from the light and bright kitchen, to the spacious family room, to the private 3rd floor retreat.